In the natural. In my own strength. I am a big fat worry wart. I am afraid of everything. I always have been. I can remember as a little girl, crying myself to sleep every single night because of fear. Fear of the dark. Fear of the boogie man. Fear of what was in that closet! Those fears grew over the years to include just about anything and everything you could imagine. Health. Injury. Personal Failure. Something happening to my husband or children…. In the natural. In my own strength. I am a big fat worry wart. September 11th has gone down in history as a day of fear and loss. If you receive my newsletter A Refreshing Pause, you have received your lovely calendar for September with your daily faith prompts and your weekly (Monday) verse of the week. Wow!! How little I realized when I chose that very for study this week, just how much I would need to remember that truth this month. Maybe you do as well! 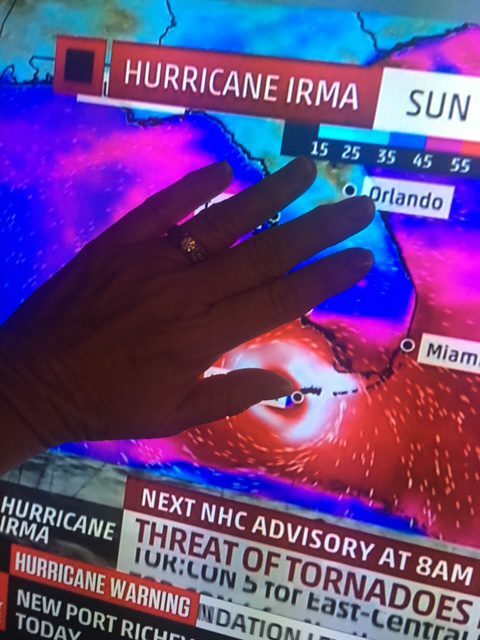 Last Monday or Tuesday, as the warning grew stronger and the possibilities grew closer for a direct hit to Florida by the massive Hurricane Irma, my natural fearfulness went into super power mode. I was PETRIFIED for my family, my kids, our home, my life! We, along with everyone we know who lives in Florida, went onto full on hurricane preparedness. 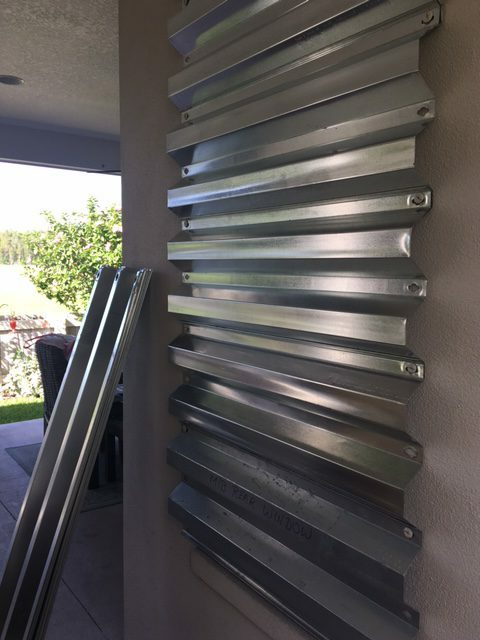 We dragged out the hurricane shutters that came with our house 3 years ago but had never been tested. We got water, canned goods and filled our tanks with gas. We put our important papers in a water/fire proof file cabinet. We got ourselves ready. I was tense. Weepy with my husband and children. Overall a hot mess. Until one day–when the storm was close enough to breath her hot stinky breath on us…I got MAD! I had heard my last announcement from the weatherman that “this storm was going to DEVASTATE Florida and take lives”. I was DONE with that proclamation and decided for all I had in me to take the authority God has given me as a believer and join the other men and women of faith who were standing firm with God’s promises. I knew in my heart that God would do what God would do but I determined at that moment, I would do what God has called ME TO DO and that is TRUST! BELIEVE! PROCLAIM HIS GOODNESS and PRAY! PRAY! PRAY. I literally put my hand over that storm and called on His name to break it apart! I didn’t just the prayers that everybody prays when bad things happen but the prayers of someone who knows Jesus intimately. I prayed like a woman who knows His Word and dwells under His protection EVERY DAY, not just on bad days! I prayed like someone who has authority in the NAME OF JESUS! My faith grew just by saying His name and by speaking God’s Word louder than the words that instilled fear and created panic in my heart. God’s word works! His promises are true and real! As you know, the storm did come. It did cause a lot of damage–but not what was predicted. Not even close! God was so powerful and held the storm at Bay. It was AWESOME to watch him literally confuse that thing!! 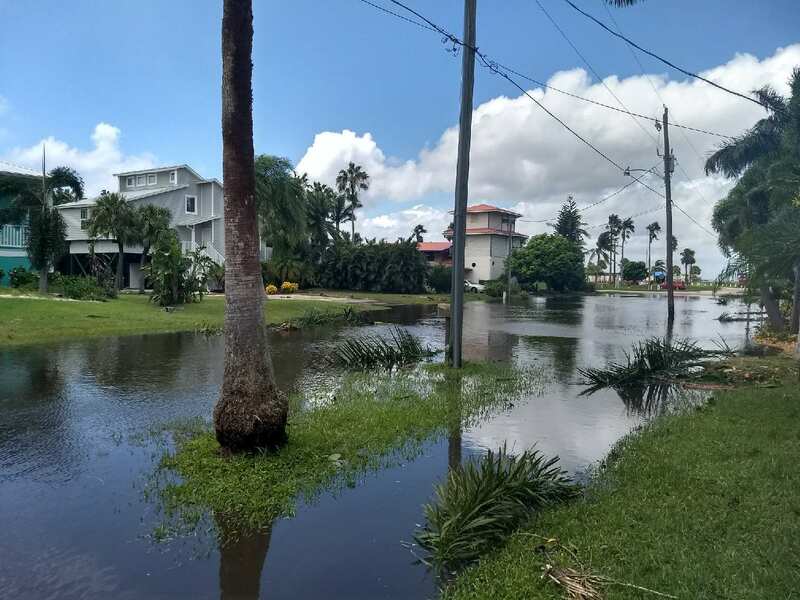 This is the street in front of our sons home in Punta Gorda. Not a drop inside!! The thing is, we know that in the is world we WILL have trouble but we are NOT to fear. I am thankful and guess what–today that storm is gone but even still–His Word is on my lips and in my heart! I am grateful to have you joining me on this weekly QUEST to live a LIFE UNSTUCK!! Tell me—where were you on September 11, 2017? Previous Post: « Tell me–What is Your Season? For a chance to WIN a Pumpkin Spiced Latte Gift Card! I’m still praising God that he calmed the storm in FL. despite the damage that occurred and so thankful their wasn’t the catastrophic damage that every news station on TV was reporting. I’m talking doom and gloom to the max! It was as if there was a competition going on between reporters, on who could make this storm sound worse and scarier than what was really taking place. Yes it was bad, but they really brought many to panic. Sure had me praying harder and panicking a bit for not only you, but for my family and friends that live there also. Thank you Pat for being an encouragement to me and so many even through the storm you were expecting, that helped settle my nerves and bring me into prayer with true faith in a God who still does miracles, and he sure did. Storm be still! My Sept. 11, 2017 was spent praying and doing some soul searching and paper work for my 12 week study I signed up for called, Mending the Soul. My 1st meeting was on 9/11. As a volunteer for CPC the directors were wanting all the Client Advocates to do this study as to better help our clients that we meet with. But I’m sure this will be of some help to me, as we all need some mending in our soul. Sept 11, 2001 will always brings back many memories of what took place that day. Love and prayer to all the families that lost loved one and to the 9/11 survivors and hero’s.